-Rewind, Boss Rush, & Time Attack modes added. Nothing about the return of the challenges from MMLC. -Museum mode for concept art & in-game music. No 3DS, Wii U, or even Switch versions for what were originally NES games is weird. Daaaaaaaaang, this is awesome! I'll definitely be picking this up if I can get around to it! Crossing my fingers there'll be a physical release later. And they better not forget about Europe this time! 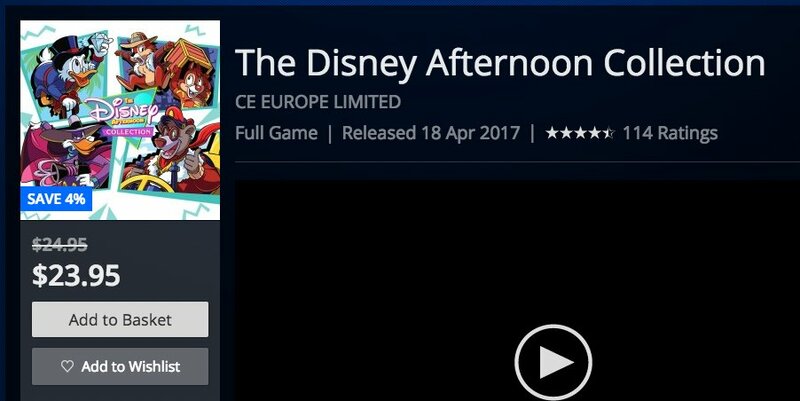 If they could only add The Little Mermaid as an unlockable bonus this collection would include all of their Disney games for the NES (that they developed). This is so awesome, I can't wait to get my hands on this. The new modes all sound like fun editions, so I'm definitely in. I only saw the picture and thought these were going to be remakes like the DuckTales one from a few years ago, but then I realized they aren't and I got sad. But dang it, I still want this! I was wondering why Goof Troop isn't included but then I remembered that it's a SNES game. The Mega Man Legacy Collection went on sale fairly quickly. I'm assuming this will too after a few months it releases. The Mega Man Legacy Collection had physical releases, Disney and Capcom would be stupid not to capitalise on physical copies for this game too! Game is on sale on PSN for $13.99 this week if anyone is interested. I haven't picked it up yet and am mulling over grabbing it now. Decided to see if it was on sale in AUS too. What a bargain! This or Mega Man Legacy Collection. Also Strider for $3 seems worth it. Touch choice for me as well. I played Strider a long time ago when it was available for PS Plus, and $3 is a great price. It's a fun playthrough. It's criminal that there's no Switch version. It's all the more insulting considering that Capcom stated that they were dedicated to developing for the Nintendo Switch. They didn't say they were dedicated to bringing everything to the Switch. While it should be on the Switch, Capcom didn't actually develop the collection, Digital Eclipse did. That said, I decided to pick it up myself with the sale. The 90s presentation of the collection is downright awesome, and while it does still feature the same slowdown you'd get with the NES versions, the games are a total treat to play. The game has a decent trophy list too in terms of objectives, but they're mystifyingly only bronze. I only played a bit of the first Ducktales so far, but I'm itching to sink my teeth into the rest.